Abstract: An ethic of self-ownership combined with Lockean homesteading of external resources provides a plausible grounding both for anarchist opposition to the state and for an attractive anarchist legal order. Such an ethic can be understood as specifying that each person prima facie has the right to control his or her own body; and that Lockean homesteading, under which the owner of any scarce resource is its first user (or his contractual transferee), should provide the basis for property rights in such previously unowned goods. Given these rules, monopoly privileges like patent and copyright (intellectual property, or IP) cannot be justified, as they infringe on self-ownership-based body-rights and/or property rights in external resources. In this article, I explain why IP rights are inconsistent with the moral grounds for a stateless society’s legal order, and speculate about the practices or laws that might prevail in the absence of IP in such a system. Libertarian Papers is pleased to announce that Matt McCaffrey, a PhD candidate at the University of Angers, Mises Institute fellow, and winner of the 2010 Lawrence W. Fertig Prize in Austrian Economics, has agreed to serve as the journal’s Assistant Editor. 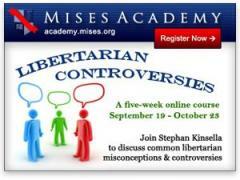 My Mises Daily article “Libertarian Controversies” ran today, discussing my upcoming Mises Academy course, Libertarian Controversies, which some Libertarian Papers readers may find of interest. Libertarian Papers is pleased to announce that Peter Klein, Associate Professor of Applied Social Sciences and Director of the McQuinn Center for Entrepreneurial Leadership at the University of Missouri, has joined the Editorial Board. As noted in Volunteer Sought for DOAJ Listings, Libertarian Papers is indexed in a large number of indexing and related services, and, since May 2009, has been indexed in the Directory of Open Access Journals (DOAJ) (see Libertarian Papers Indexed in DOAJ). Our journal entry is here. Only our very first article had been manually added to the DOAJ index–now, thanks to the volunteer efforts of LP supporter and author Lee Haddigan, all of LP’s articles are now listed in the DOAJ database, and all future articles will be added as they are published. Thanks Lee! Libertarian Papers is indexed in a large number of indexing and related services, and, since May 2009, has been indexed in the Directory of Open Access Journals (DOAJ) (see Libertarian Papers Indexed in DOAJ). Our journal entry is here. Apparently each article published in LP has to be manually added to the DOAJ index via our publisher interface. 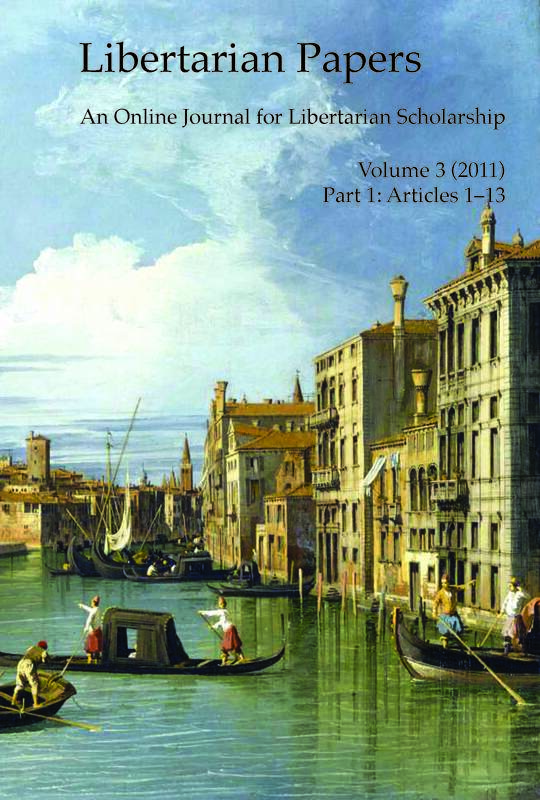 The only article included at present is our very first article; the remaining articles from Vol. 1 (2009) are not yet included, nore are any articles from Vols. 2 and 3 (2010-2011). I need a volunteer to manually add these approximately 100 articles to the DOAJ database manually via the publisher interface. Then I can add new articles to the DOAJ database each time we publish a new article. If you are interested in assisting, please let me know (contact). After some digging, I found Mark Stanley (email: jmark@mises.com), who did a great job for me converting the files into “books” for both print and ebook purposes (PDF files for the former, and epub and .mobi files for the latter). The first two volumes, for 2009 and 2010, were each over 800 pages (each including 44 or so articles). I decided to split each volume up into two parts, Part 1 and Part 2, similar to a conventional journal’s “issues,” each Part having 400+ pages and 20+ articles. And there are corresponding ebooks. As can be seen on the journal’s Paper and Ebook Versions page (see information pasted below), the first two volumes are now available in print and ebook versions. The print versions are available from Amazon and CreateSpace (the Amazon subsidiary I used for the print-on-demand books; one advantage of CreateSpace over LuLu for print-on-demand is that they automatically list the book on Amazon). And the ebook versions are now available on the Kindle, Nook, and iBookstore platforms (Sony Reader versions should be up before long). I used BookBaby, an ebook aggregator, to publish on all 4 ebook platforms, for convenience. CreateSpace assigns an ISBN for the print version for free, and BookBaby assigns an ebook ISBN for a small fee. I priced the print versions a bit above cost and the ebooks at $9.99 to make a few bucks per copy. I could price them lower, but I would like to recoup my costs (paying Mark for his formatting work, the CreateSpace “pro” charge and the BookBaby charges, and a few other incidental costs). I figure if I sell maybe 70-100 copies per “issue” I will break even and will be able to continue doing this going forward. If I sell more, I can use the extra funds for a few other little things to improve the journal, and/or lower the price going forward to fine-tune it to break-even. Links for the various versions of the first two volumes are below. I intend to release Vol. 3, Part 1, shortly, rather than waiting to the end of the year; that means Vol. 3 will probably have 3 or 4 smaller-sized Parts (say, 200-250 pages) instead of two big ones. If anyone orders any of the ebooks or print versions, please feel free to send me any feedback, comments, or suggestions (here in the comments or by email). Libertarian Papers articles will occasionally be collected into Parts (like issues) and offered for sale in print versions and epub versions on the major epub retailers. Epub versions for the first four issues are sold at $9.99, and print versions sold a slightly above the print-on-demand cost (with a discount at CreateSpace if you use the discount code TV6PLDNW). The O.P. 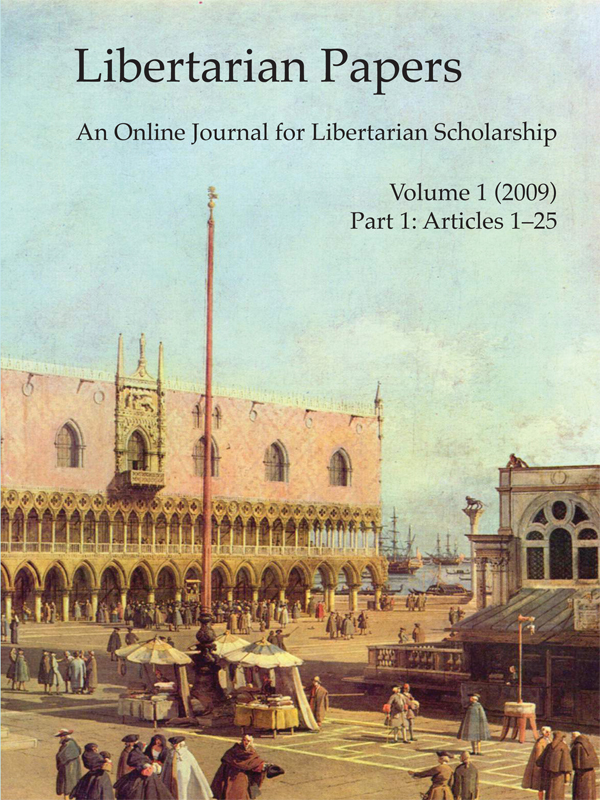 Alford III Prize in Libertarian Scholarship is a $1000 prize awarded by the Mises Institute each year for the the article published in the preceding volume of Libertarian Papers that best advances libertarian scholarship, as chosen by the journal’s Editor and Editorial Board. There were forty-five articles were published in Libertarian Papers in 2010. The 2010 award was given by Mises Institute President Doug French at the Austrian Scholars Conference 2011 to Professor Philipp Bagus for his article “Austrian Business Cycle Theory: Are 100 Percent Reserves Sufficient to Prevent a Business Cycle?” (See the video of Bagus’s Murray N. Rothbard Memorial Lecture.) 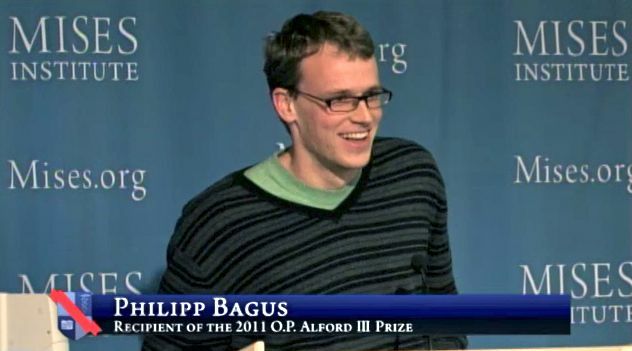 Congratulations to Dr. Bagus. Libertarian Papers has in the past produced print archives (paper versions) of its articles. Our last volunteer, Gil Guillory, had to quit so we have a need for some volunteer assistance help assemble Vol. 1, Part 3, and two or three parts for Vol. 2. Ideally I’d like it kindle formatted and also a PDF version that I can use for Lulu or Amazon’s print on demand service. I need someone who can take a batch of Word files and create these files for me, with some guidance from me on cover, etc. If you would like to help, please let me know (contact). We are pleased to announce that the distinguished philosopher Gerard Casey, of the School of Philosophy, University College Dublin, author of various works such as Born Alive: The Legal Status of the Unborn Child (Chichester: Barry Rose Law Publishers, 2005) has joined the Editorial Board of the journal. I am seeking volunteer referees to review 7 draft articles submitted to Libertarian Papers. I list the titles and Abstracts of a few of them below. Abstract: Examining the legitimacy of government by using Reductionist and Emergent principals. The essay addresses issues on morality, the is – ought fallacy, and the misrepresentation of government. Abstract: What is the adequate normative response to a growing trend of language shift in a given small linguistic community, either a minority or a majority community in a given liberal country? This essay attempts to answer this question. I shall analyze carefully whether the members of this small linguistic community choose to continue (or choose not to continue) to use their mother tongue. Carefully examining the ‘choice’ aspect of the decision to shift from language A to B is important for the analysis of a language shift scenario, as a proper understanding of the ‘shifting decision’ is crucial for any attempt to theorize about the proper governmental response to a language-shift scenario. I shall analyze the decision to shift from one’s mother tongue to a different language, following three different theoretical perspectives: libertarian, left-liberal, and national/identity. Following which I shall analyze three potential governmental responses to a language shift scenario from the same three theoretical perspectives: libertarian, left-liberal and national/identity. The last part of the essay discusses arguments that may assist us in deciding among the potential governmental responses described. Abstract: In this article I summarize Friedrich Hayek’s cultural group selection theory and describe the evidence gathered by current cultural group selection theorists within the behavioral and social sciences supporting Hayek’s main assertions. Before concluding with a few comments on Hayek as a libertarian, I also describe three ways in which current cultural group selection theory has superseded Hayek’s views. Abstract: The present paper challenges today’s consensus that the Constitution plays no role in limiting the federal government’s exercise of its monetary powers. Noting a growing international consensus regarding the need for monetary reform and reviewing the Supreme Court decisions which led to today’s American monetary system, the author argues that unless the Constitution is returned to its proper role in limiting the federal government’s exercise of monetary powers, a legal system may emerge far beyond the control of the American people and absolutely contrary to their best interests. Abstract: In this brief essay, I outline the implications of Praxeology for a variety of kinds of Value pluralism. I attempt to show how action, logic and even belief itself, results in a self refutation of these doctrines. Abstract: What this paper attempts to demonstrate is that, in his treatise Liberalism, Mises’ defense of liberty is incomplete because his reasoning in favor of liberty for all is – not of a moral, but – exclusively of an economic kind. Without a moral justification, Mises’s defense –- once the aim of productivity has been abandoned–is forced to affirm with cold indifference that a society of slaves is no better or worse than one of free men. There exists a more comprehensive defense. (from introduction): Some would have it that we can have a philosophy of freedom without, well, a philosophy. In other words, they find it rather pointless to dwell on various philosophical topics, such as free will versus determinism, the problem of knowledge, what is the nature of right conduct and so forth. Instead they wish to focus on so called practical issues, such as how much prosperity or science or satisfaction is produced in a relatively free versus planned society. As if these considerations didn’t have some philosophical dimensions. Without by any means implying that philosophical issues are exclusively central to a defense of a just system of human community life, it would be of some value to see what philosophy can—indeed, needs to—contribute to such a task. Let me take a brief look at some of the most important of these. We receive a variety of submissions on various topics of libertarian scholarship, such as philosophy, economics, legal theory, political science, history, and social/cultural analysis. If you are interested in serving as an occasional referee, please contact me privately at nskinsella@gmail.com. Law Professor Gary Chartier, of La Sierra University, has joined the journal’s Editorial Board. Professor Chartier, author of the forthcoming The Conscience of an Anarchist, was recently awarded the La Sierra University Faculty Senate’s once-every-three-years Distinguished Scholarship Award. We are honored to have his participation. Note All subscribers to the Libertarian Papers Facebook GROUP: I have migrated that group to this Facebook PAGE instead. Please become a fan of this instead of the old group.